A Royal (Blue) Finish on a Grey Monsoon Day! This is a first anniversary present for my son and daughter in law, both great fans of grey and royal blue. I made it with the blocks from my Block Party on Bee Desi, my virtual quilting bee from the Desi Quilters group. 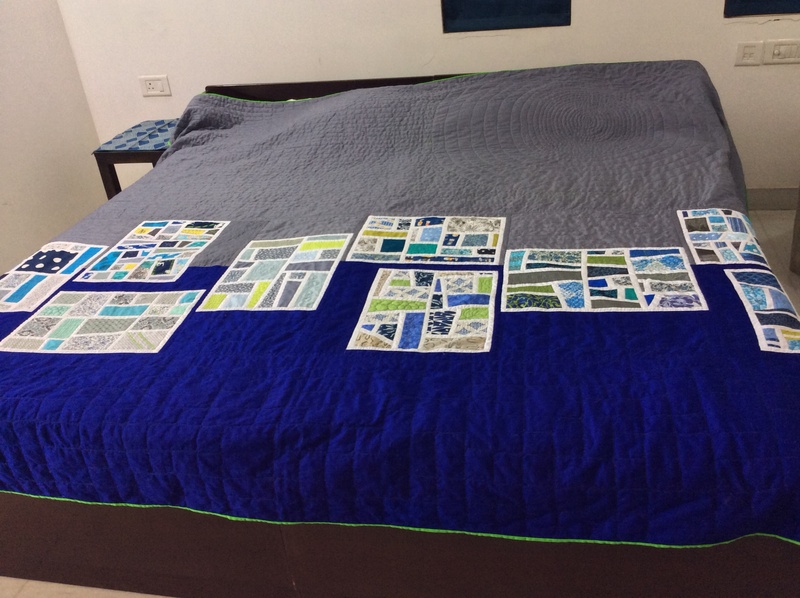 Before I show you the full quilt, I must show you the beautiful Mod Mosaic by Elizabeth Hartman blocks made by the Desi Quilters! There is something so fascinating about bee blocks! My son had got engaged at the time these blocks were being sewn. 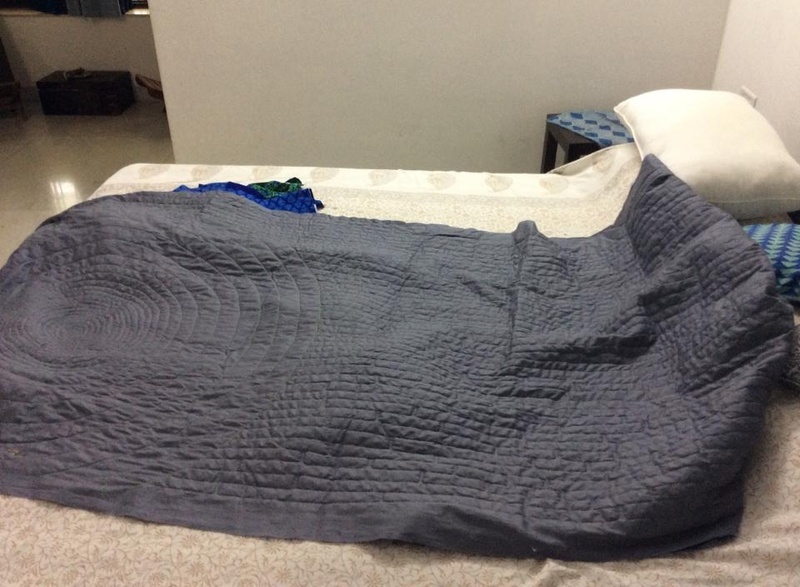 How appropriate that they should go into a quilt for him and his wife on their anniversary! I thought about the difficult time our family was going through with my daughter critically ill, around the same time. Somewhere, the love and care that each quilter poured into each of these blocks reached out to me and my family… As for the blocks themselves, as I quilted them I wondered about the story behind each print. I thought of a quilter generously cutting up some favourite new fabric to put into her block. Or were they scraps left over from a dress made for a daughter or a grand daughter? A much loved cushion? Or even a quilt? Who was using them now ? 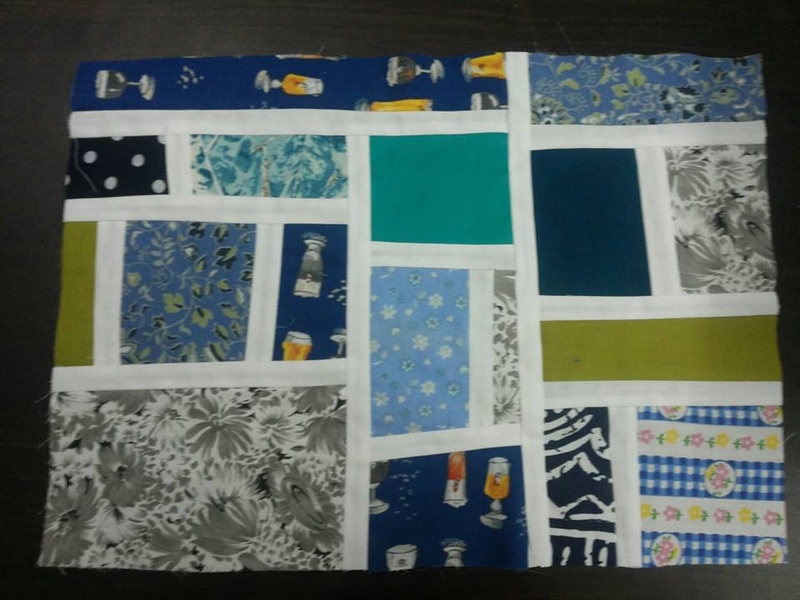 The child scraps, travelling miles away from their home to be made into a quilt which will now go all the way across the oceans to America…How very special bee blocks are! 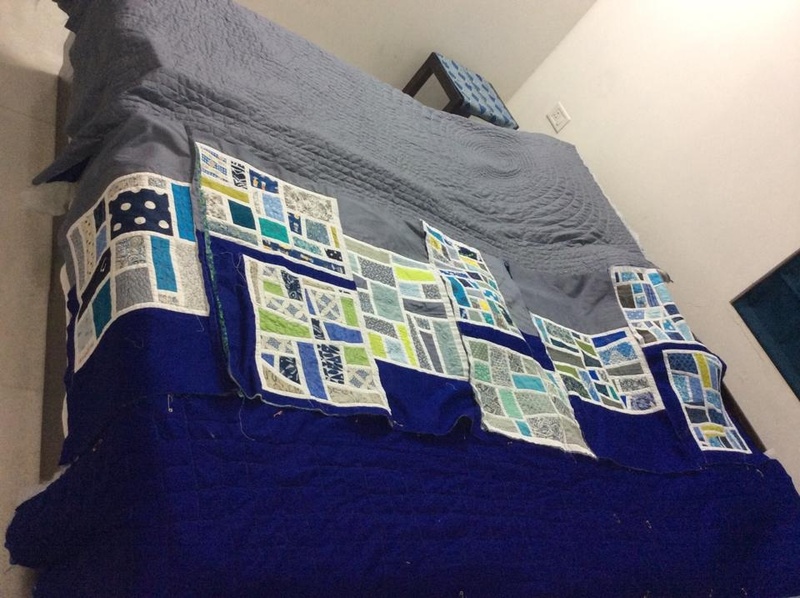 I had a total of 9 blocks, all of different sizes and putting them together to make a whole quilt was impossible. To cut a long story short, I decided to put the blocks together in a horizontal row of 30″ with grey above and royal blue below! Then began the calculations as I wanted a straight line across where blue met grey! I worked on the free quilt design software, QuiltAssistant and came up with this! 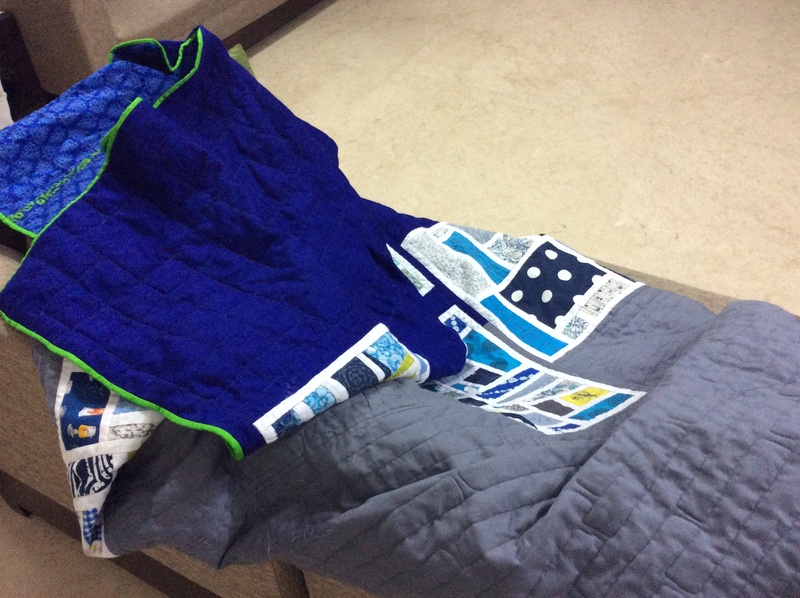 Each giant block was a different width and quilt as you go (qayg) seemed to be the only option for putting it together! 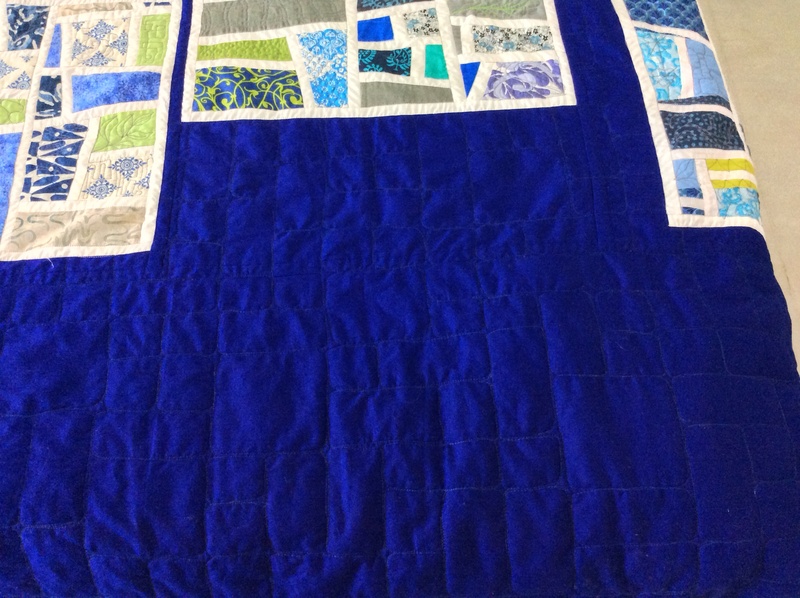 I used a great tute at the Quilting Edge, but I hated the qayg! The quilt came together in 3 panels, finally. 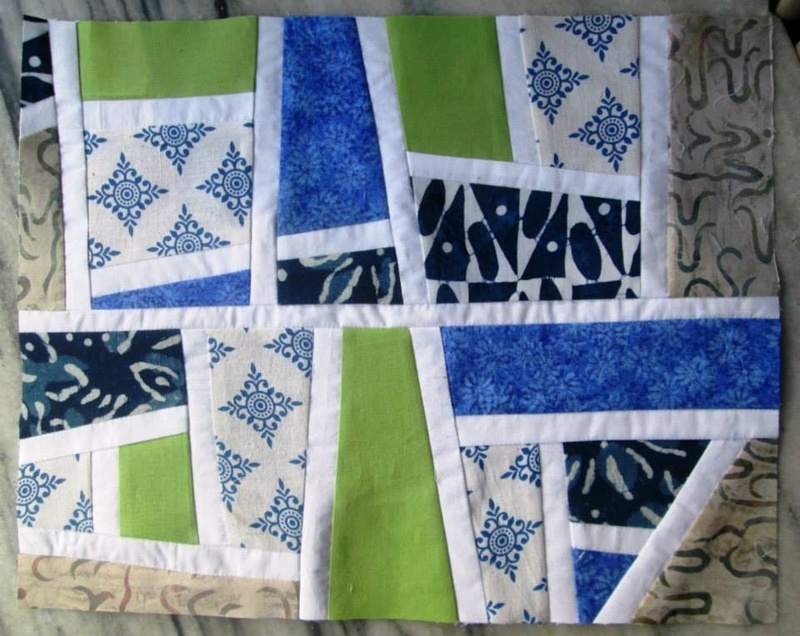 I used a cambric print in royal blue for the backing, joining up the qayg blocks and panels with narrow strips of a blue and lime green fabric. The batting was a thin 120gsm polyfibre. 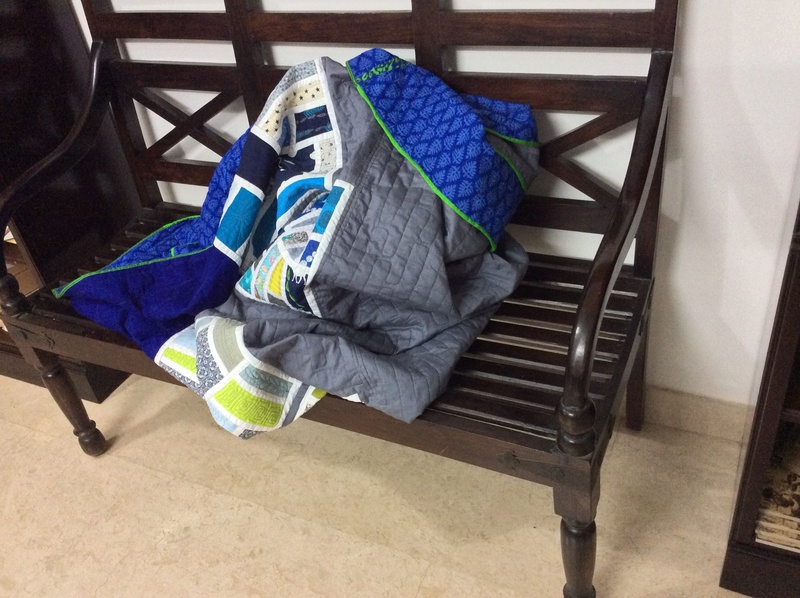 The 46″ wide grey was quilted with a giant spiral covering almost the width of the panel, in a variegated grey thread in the centre and lime green on the outer circles. The rest of the panel was majorly filled up with a boxy version of the “etch and sketch”” filler stitch by Leah Day, petering out into wavy lines ending in tiny spirals on the left edge. To do this, I drew lines 1″ apart on the top and worked on that. Here, the quilting was in lime green thread near the spiral and a dark grey matching the fabric in the rest. 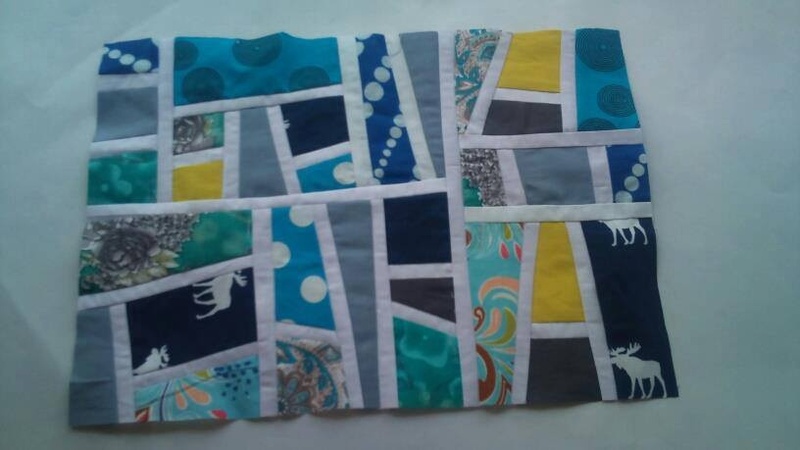 The ‘windows’ in the Mod Mosaic blocks were filled with different designs from Leah Day’s 365 days free motion quilting project and a few motifs from Lori Kennedy’s The Inbox Jaunt! For the royal blue, I used Leah Day’s ‘cubic ripples’ as an inspiration, but gave them more structure and developed it into a ‘Tetris’ game like pattern. 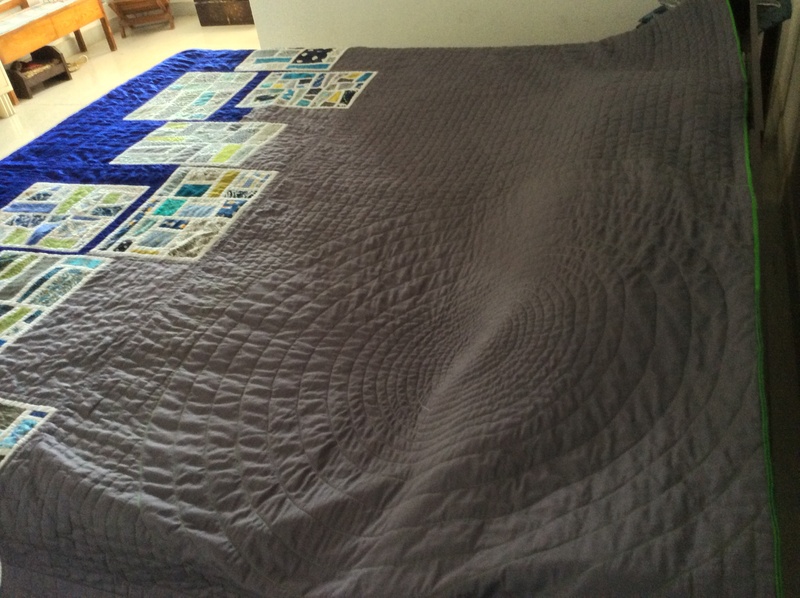 I drew lines at 2″ apart vertically on the 16″ row and quilted 2″ and 4″ squares and 2″x 4″ rectangles. This was a fun design, as I challenged myself not to stack up similar ’tiles’ in close proximity. 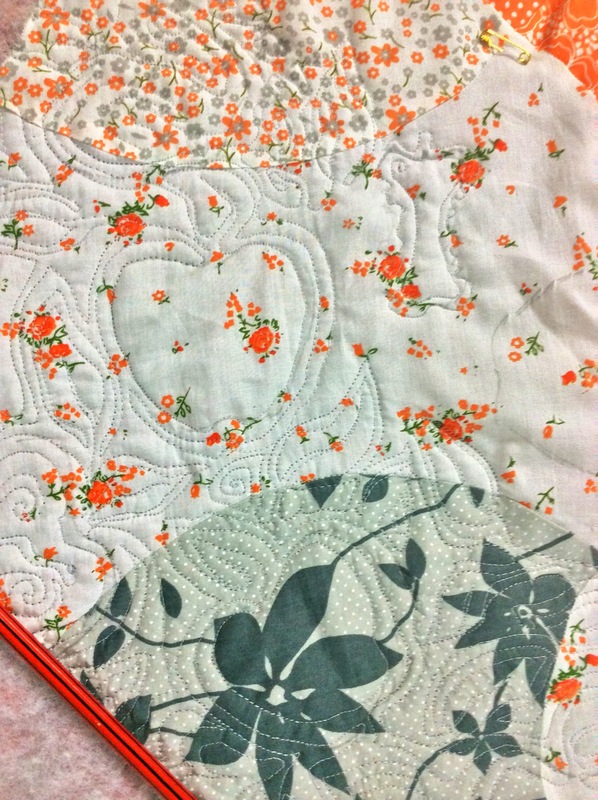 For the binding I chose a lime green to brighten up the drab grey which made up half the quilt. I cut the binding the wrong width – just 1.5″ but there was no way I was going to waste 400″ inches of binding. And I had already sewn half a side before it struck me what I was doing! So I decided to go ahead with it; I do want to think the 1/4″ binding adds a touch of elegance to the quilt – so “not over the top”! 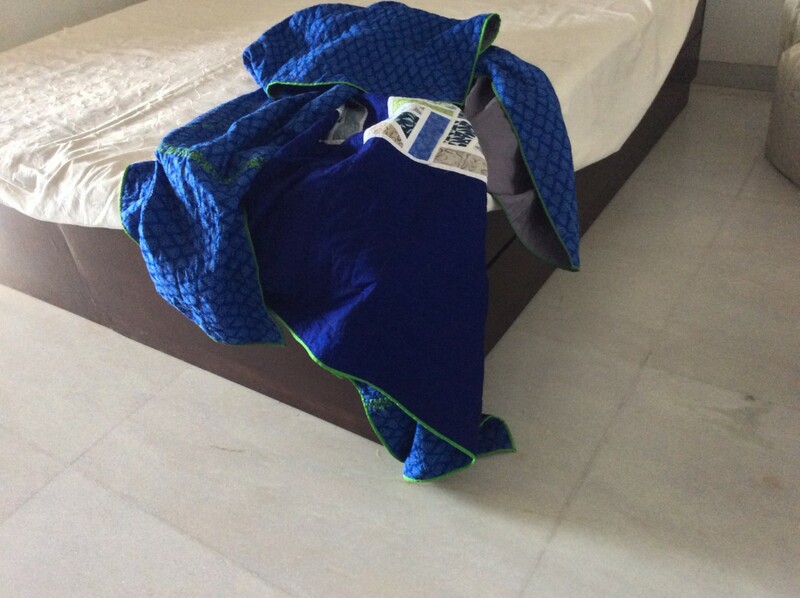 All the quilting was done on my Husqavarna Viking Topaz 20 with its inbuilt auto sensor system for fabric thickness. 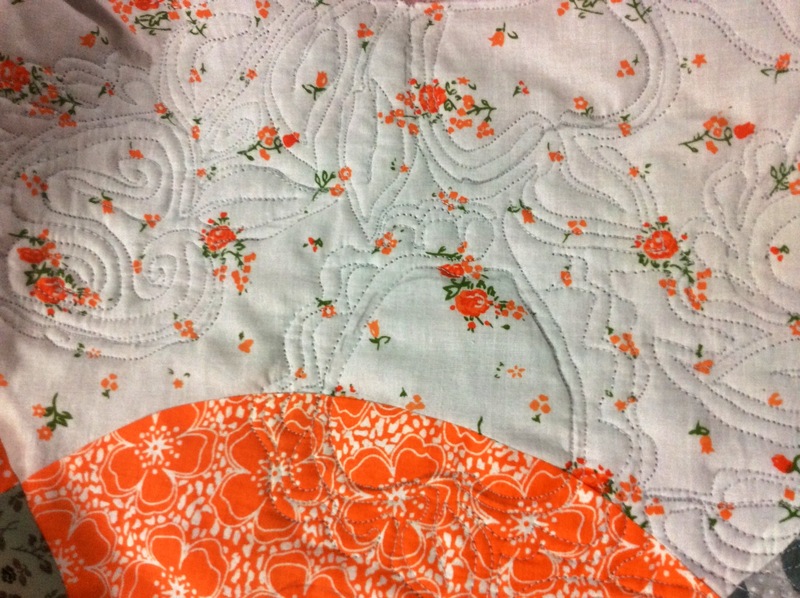 I had some problems initially when using the spring action fmq foot, but when I switched to the echo quilting foot, I soon got the hang of the right rhythm and everything went smoothly – like a dream! 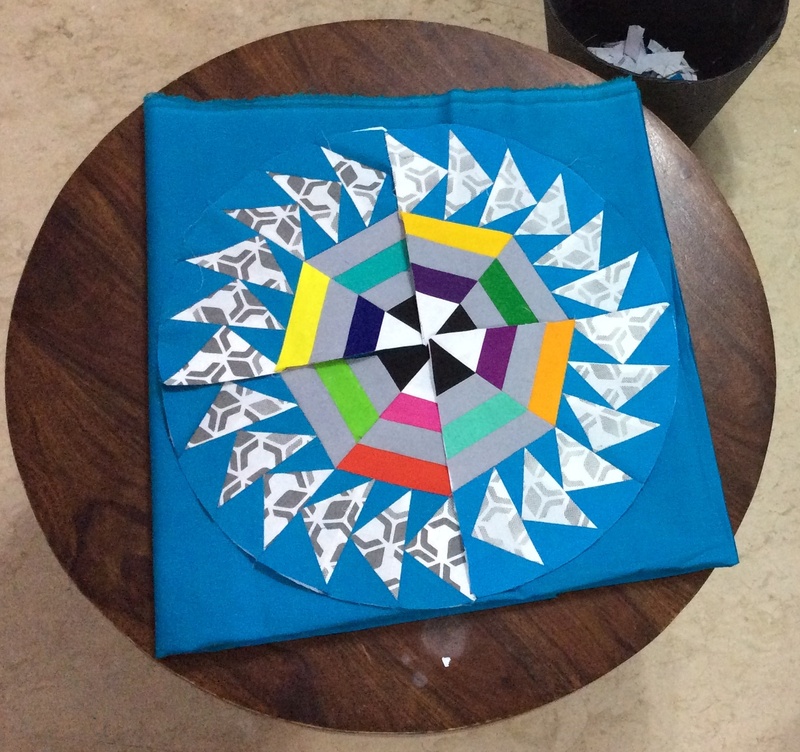 Mod Mosaic blocks in a row – the rightmost is the ninth – made by Sandhya S! A giant spiral 38″ in diameter to offset and soften the rectangular blocks. The lines were added to accentuate the horizontal panels. 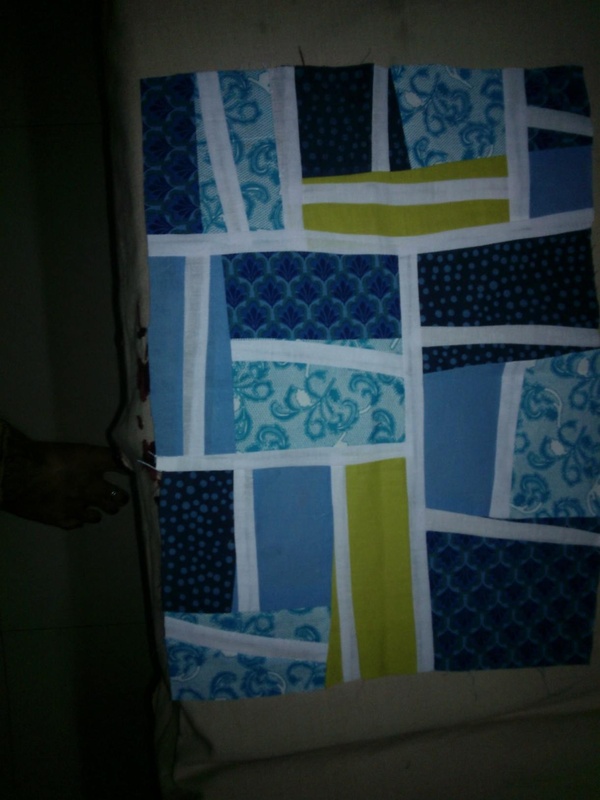 The quilt is a square, may be used either way? Now to pack it up! Ready for packing? Not before one last look at it! With blessings and love, from Ma! Thank you, all you beautiful ladies, who made the blocks for this quilt! Author MadsPosted on August 26, 2014 October 8, 2014 Categories My Quilts, Patchwork of my lifeTags Bee Desi, Block Party, desi quilters, Elizabeth Hartman, fmq Tetris, Fransson!, free motion quilting, Mod Mosaic Block, modern squares block, Quilt Block, Quilting bee block, quilting in India, spiral quilting, virtual bee6 Comments on A Royal (Blue) Finish on a Grey Monsoon Day! My laptop is back at the service centre and it is really difficult to do a full blogpost on the iPad! 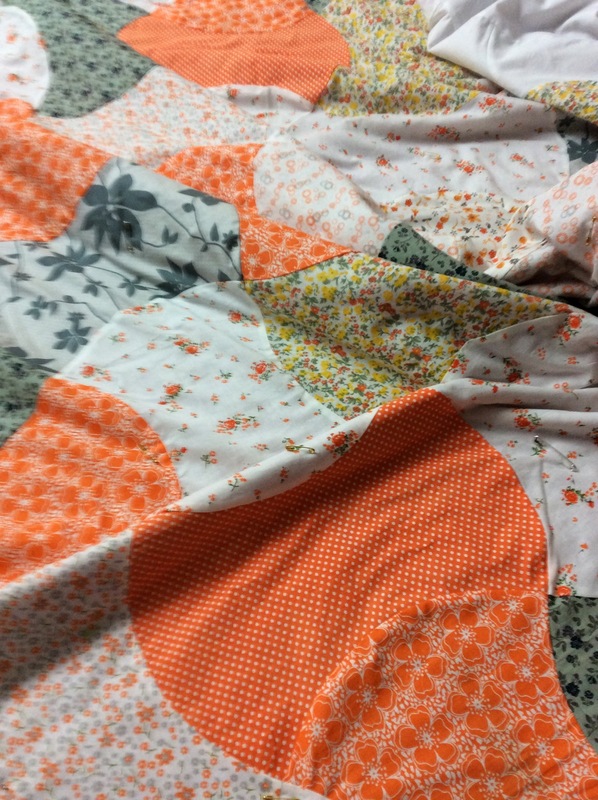 I decided to share a couple of photographs of a quilt I have started quilting today. I got the pattern The Big Apple from the ‘Love of Quilting’ magazine August 2012 issue. It is also available online on the Fons & Porter website. 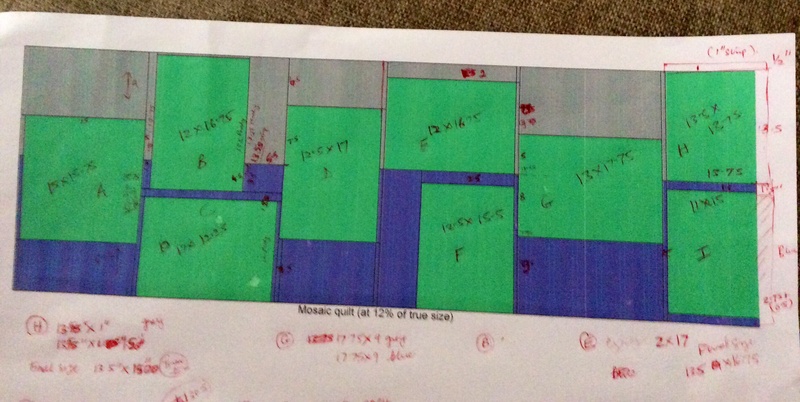 I wanted a larger quilt, so decided to make it into a 10 x 11 grid which will measure up to a comfortable 89″x 99″. I used fabric from my stash, and that measured up to only 80 apple cores! So I had to add a plain white solid to build up the length. Here it is all basted and ready for quilting. I know my quilting is nowhere half as pretty, but practice is the only way it will get better! If I don’t put it away, I have my work cut out for the next two months at three hours per day! What have you all been up to? Other than Block Two of the Round the Year quilt, that is? Author MadsPosted on August 23, 2014 August 23, 2014 Categories Patchwork of my lifeTags apple core quilt, free motion quiltingLeave a comment on So, what’s cooking? Apples! When I left you, this is where we were, 16 templates pieced and ready for assembly, using the master template as a guide. Actually, with this picture, gasping in admiration at what you had put together! 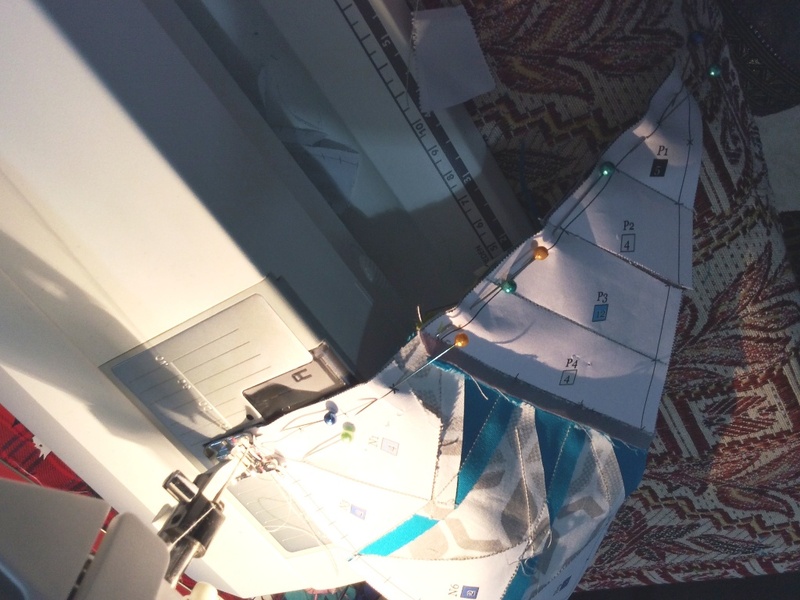 So after you’ve finished admiring your templates, head back to the sewing machine. This will come up really fast, and before you know, your block will be ready! 1. Template A to template I; B to J; C to K….H to P! Place templates A and I right sides together and push pins to align them. Secure with pins along the seam line and remove the hanging pins. Sew all the pairs, AI, BJ, CK…HP. Remove the paper from the seams and the paper pieces that do not have alignment markers. Press seam line in alternate directions – as in the corresponding pond template. Join these eight segments in pairs to make quarter circles. AI to BJ, CK to DL, EM to FN and GO to HP. If you want you can remove the paper pieces on the pond templates now. Align the two adjoining segments with pins. I need to be very careful at this stage, as I always end up joining the pairs along the wrong edges – pinning helps prevent that. Secure the two sub blocks together with pins and remove the hanging pins. Ready to sew! The quarters are finally ready to be joined to the respective background pieces. Rainbow against a blue sky! The next block is ready to be revealed on the first of the next month! While you get your second block ready, I’ll get my blogpost ready! 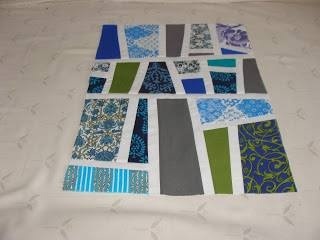 Do post pictures of your block on my facebook page Patchwork of My Life! This, EVENING AT THE POND, the second block in my Block of the Month quilt ‘Round the Year’ , is a favourite of mine! 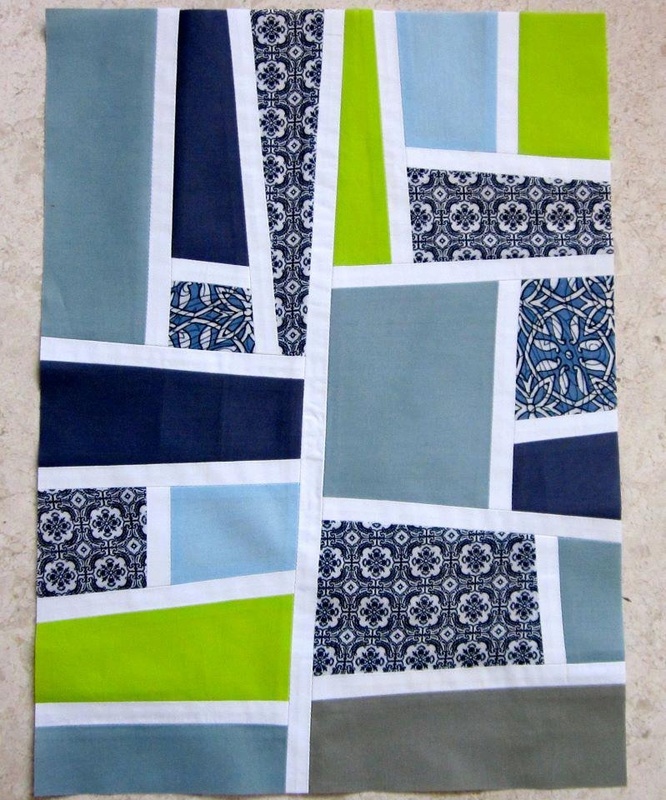 For those of you who came in late, this quilt is being made in two colourways. The first, Dusk is in blues, oranges and yellows of a brilliant sunset, while the second, Rainbow is a more modern version with rainbow colours set against grey and sky blue. This particular block went through several reincarnations before acquiring its present form, but that deserves its vey own blogpost! It was tested for me by Nikhat Syeda Arshia and by Sobana Sundar, who has shared her adventure of testing an earlier version of the block on her blog. These are instructions for the “Rainbow ” colourway, including the paper piecing templates, fabric requirement and cutting instructions. These instructions can also be downloaded in a printable .pdf format from the link at the end of this post. The fabric requirement for the Dusk colourway was posted a few days ago. The block is paper foundation pieced before being assembled. The finished block size is 18″ square with an inset circle of 15″ diameter. Cut the 2″ X50″ grey strip for the pond into 12 rectangles – 4 strips each of 5″, 4.5″ and 3.5″. Template S in 2 pieces S1 and S2 for one quarter of the outside square. Join the quarter circles to Q, R, S and T respectively to get four quarters of your final block. 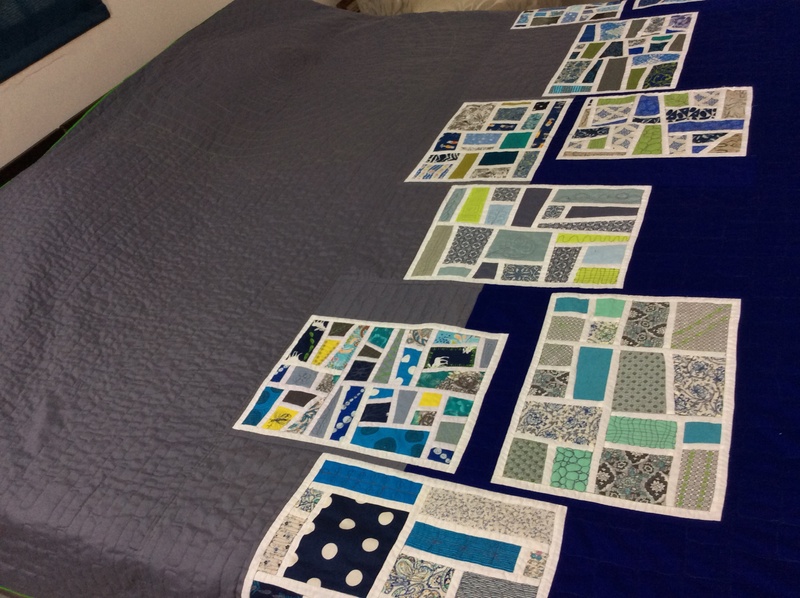 Assemble the 4 squares; square up the block to 18.5″ – we are done! Refer to the Master template below as a guide when assembling the paper pieced templates. You can also use it to try out your own colour schemes; use colour pencils! 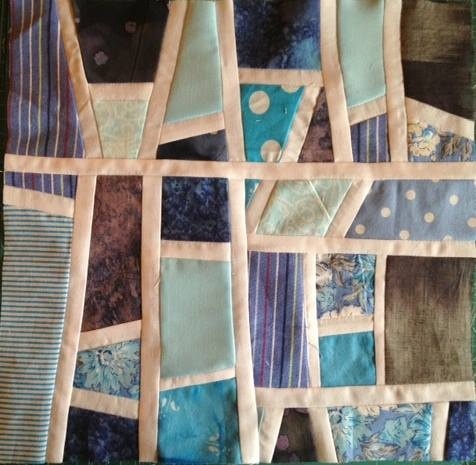 I would love to see pictures of your completed blocks on my facebook page “Patchwork of My Life” – a link is on the sidebar! While all my Dreamcatcher patterns are free and will continue to remain so, may I suggest you visit the webpage of my favourite NGO Samarpan and donate whatever you deem fit towards the wonderful work they are doing to spread joy, peace and happiness through the world? Thank you! This post seems to be jinxed! I wrote the whole post, to find that I had overwritten the assembly instructions. Those will follow in another post! My laptop is back from the service centre with a new hard disk, but I am not able to locate all the pictures! 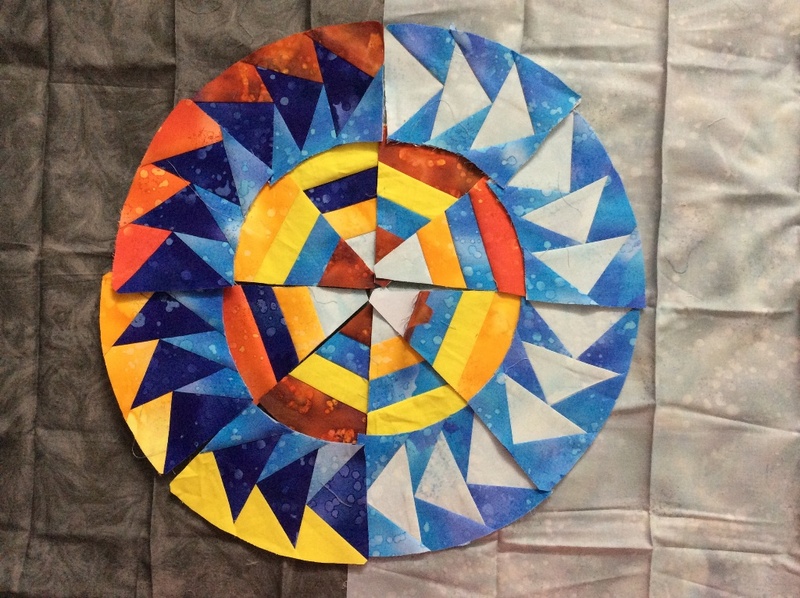 So here are the step by step instructions for piecing the Evening at the Pond block, ( the second block in the Round the Year Block of the Month quilt) with the pictures for a few steps missing. 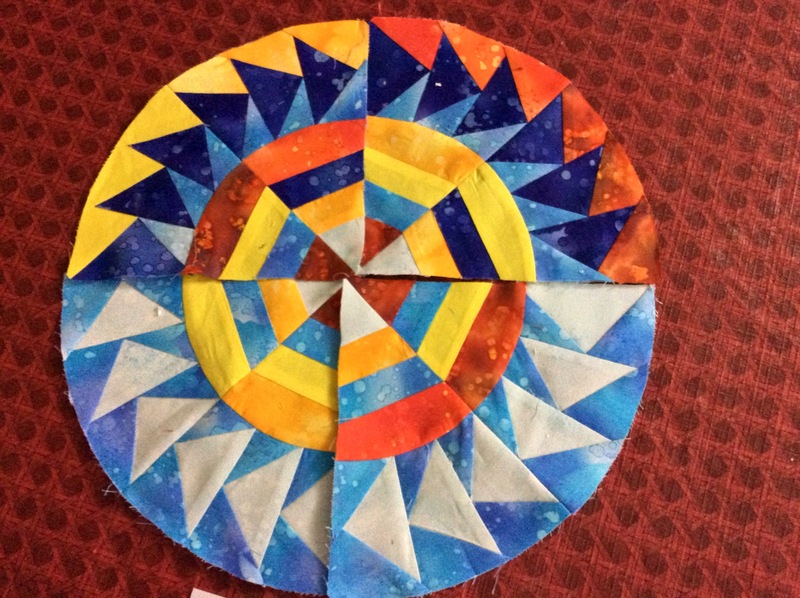 As you may recall, here also the finished block size is 18″ square with a 15″ inset circle. 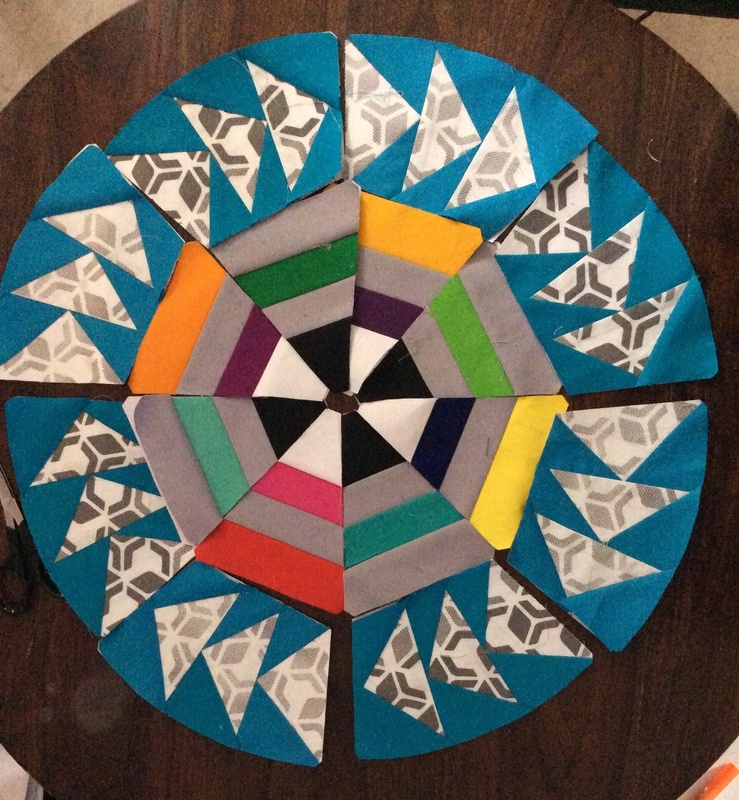 The block is paper foundation pieced before being assembled. This is a really easy block, though you may find piecing the flying geese a bit tedious! I know that I thought the Dahlia block was super easy to piece, not so easy to assemble. This one is really, really easy to assemble, it has no curves anywhere! Take a print out of the Instructions File and keep it hand. Colour code the fabric you plan to use. Follow the instructions to cut the fabric. If your fabric is pre-starched, it gives a nice, crisp, neat finish to your final block! using the colour code as a guide – I always do that or I get confused what goes where!! The templates A, C, E and G are pieced from the outer edge to the centre and the alternate pieces B, D, F and H are pieced from the centre outwards. The adjoining seams facing opposite directions ensures a nice `fit’ when the pieces are finally assembled. Right sides together – ready to piece! Unpin the two fabric pieces to be joined, place them on the wrong side of the template, keeping a seam allowance of ¼” approximately. The remaining two pieces are pinned back to the template so that they don’t get misplaced and mixed up! I chain pieced the templates in alphabetical order, so that my chain looked something like this! My fabric pieces are not rectangles like yours will be – this is so that you do not make stupid mistakes like I did! Lesson learnt – Resist the temptation to trim the fabric pieces to size before you sew them! Also remember to flip over your piece No 2 to ensure that it covers the entire section that it is supposed to! Or you may end up using the services of Jack the Ripper! One way to ensure that is to lightly fold the fabric piece to find the centre and do the same for the paper template, and match them when sewing. ( However, this is unlikely to happen to you, because I have made the pieces really long, with a lot of margin of error! Now that all the 8 pond templates have the sections 1 and 2 pieced, we clip apart the templates and head to the ironing table. Trim seam allowance to ¼” if needed. You can just eyeball it and use your scissors to trim the seam – not necessary to use the services of a rotary cutter. Press open piece 2; if your fabric is well starched and crisp, you may just finger press. Similarly attach piece 3. Trim seam allowance to ¼” and press open the third piece. Attach piece 4, trim seam allowance to ¼” press open. Trim the excess fabric from the sides and our pond pieces are ready! That was really easy, wasn’t it?! Do not get confused by this picture! I changed the pattern after I made this block, so your pond templates will add up to an octagon, not a circle! The templates I to P will be pieced to make a ring of flying geese. Here chain piecing is not really possible, so this bit of piecing goes a bit slow! 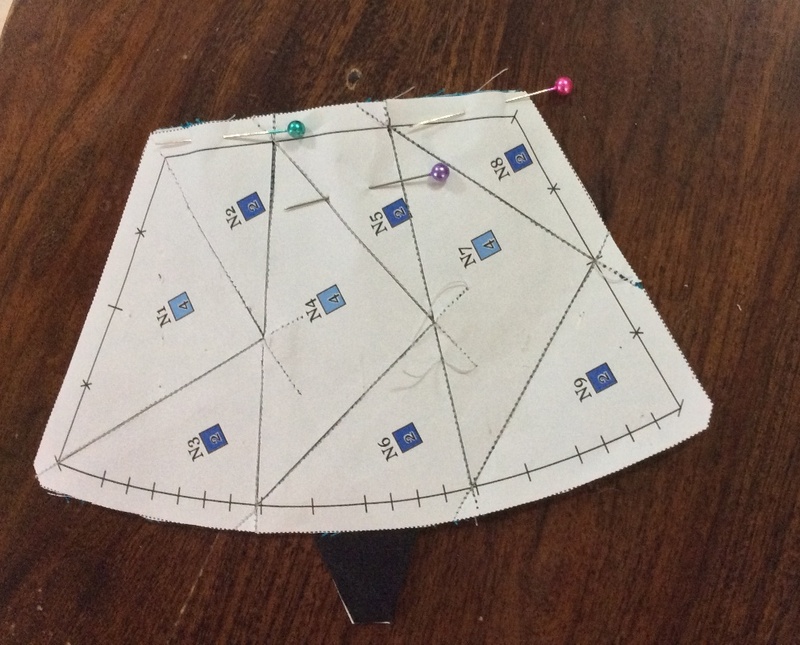 Place the first rectangle for the goose (wrong side of fabric touching paper) so that the seam allowance between Goose 1 and Goose 2 extends about a ¼” beyond the seam line, like in the picture below. Caution : The next few pictures are of a previous version of the block, so please do not get confused by the template numbers or order of piecing. 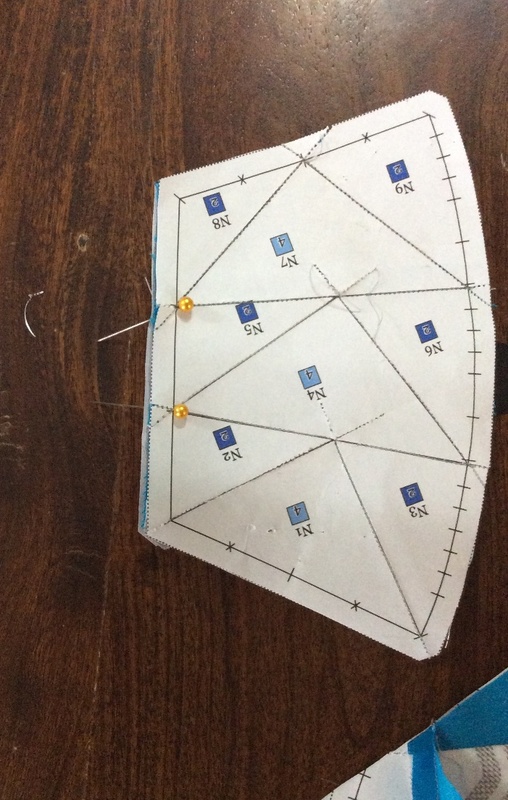 Sew on the seam line, extending your seam line to approximately ¼” beyond into the next section. Flip over and trim the excess fabric to leave a seam allowance of ¼” , press open. Similarly sew the other triangular `sky’ piece, going beyond the centre point, like was done for the previous piece. Now trim the seam allowance to ¼” and press open. The first goose is ready! 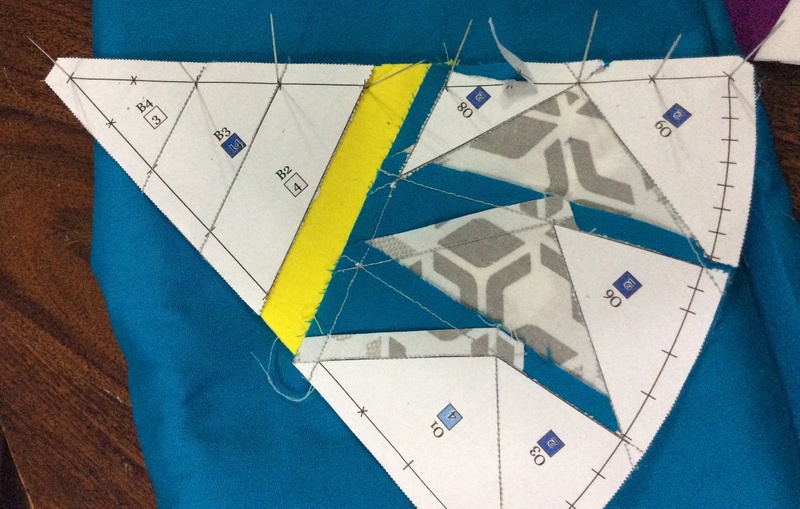 TIP – Before sewing the sky pieces, do remember to check the placement of the piece so that it covers the respective `sky’ section fully when pressed open. This is especially true of the sky pieces on the outer border of the ring. 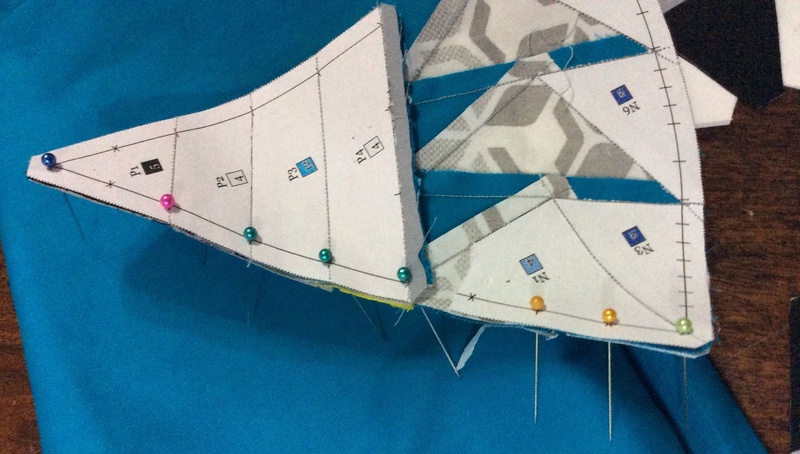 Fold back the paper on the seam line between the just pieced section and the next – that would be the long line of Piece 4. You will need tear a bit of the paper here, to detach the top seam allowance from the paper. No worry! Trim this seam allowance to ¼” on the just pieced portion. Place the rectangle piece for the second goose, right side down on the just pieced section and sew. Press open. Continue to piece as in previous sections. Here is a picture taken by Sobana, who tested the block! This is how it looks from the back! You can see how the seams extend into the adjoining section in the centre of the template. And here is the full ring of flying geese made by Sobana! Aren’t they pretty? Ring of flying geese! Love it! 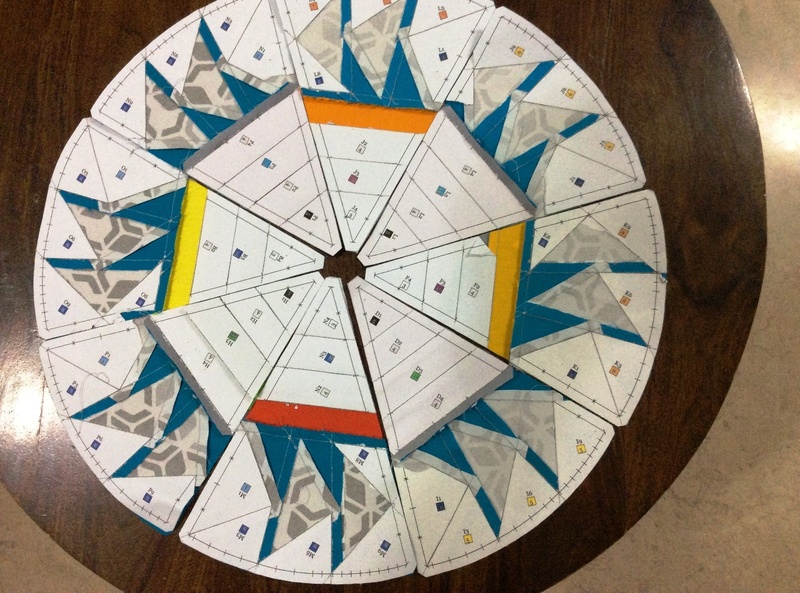 So all our templates are pieced! Using the master template as a guide, arrange your templates and admire them! The assembly instructions will be online soon, while you get cracking on this! You can download the instructions and templates files here. You can access the pattern for the first block, Dahlia here. Growing up on tales of His mischievous childhood, I got to love Krishna almost as an elder brother who would hold my little finger and lead me through troubled times. He was the One to whom I poured out my heart , sharing my smallest joys and deepest sorrows! As I grew older, He continued to play that role, trying to guide me, through the Bhagvada Geeta, to become a better and happier human being in all ways. Today, I wish to share with you a Sanskrit shloka dedicated to Him, which gives me so much hope and joy in times of deep despair! I pray to Him that it does the same for us all! (Helps) the lame cross mountains. This, the second block in my Block of the Month quilt ‘Round the Year’ , is a favourite of mine! 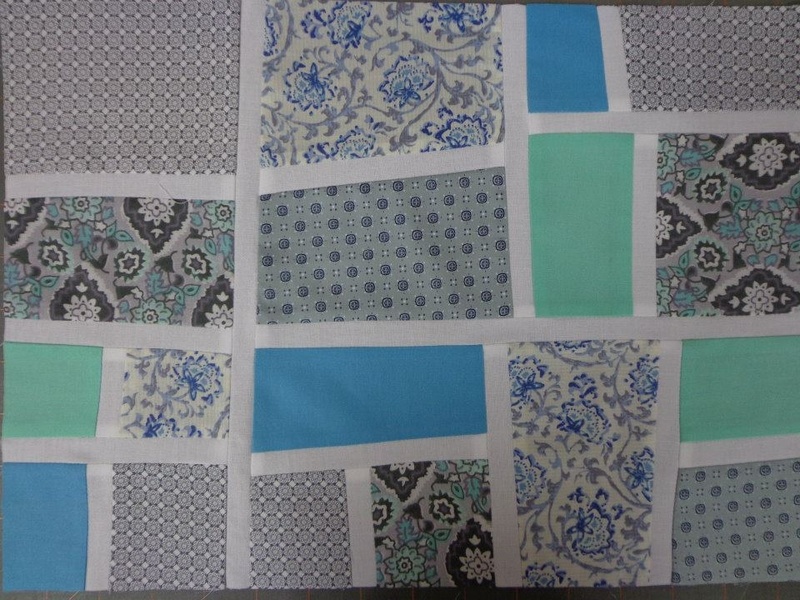 For those of you who came in late, this quilt is being made in two colourways. The first, Dusk is in blues, oranges and yellows of a brilliant sunset, while the second, Rainbow is a more modern version with rainbow colours set against grey and sky blue. This particular block went through several reincarnations before acquiring its present form, but that deserves its vey own blogpost! It was tested for me by Nikhat Syeda Arshia and by Sobana Sundar, who has shared her adventure of testing an earlier version of the block here.I am not including any photos in this post to help you along as you construct the block, as I do not have access to them at the moment – they are being extracted from a hard drive which developed “bad sectors”! 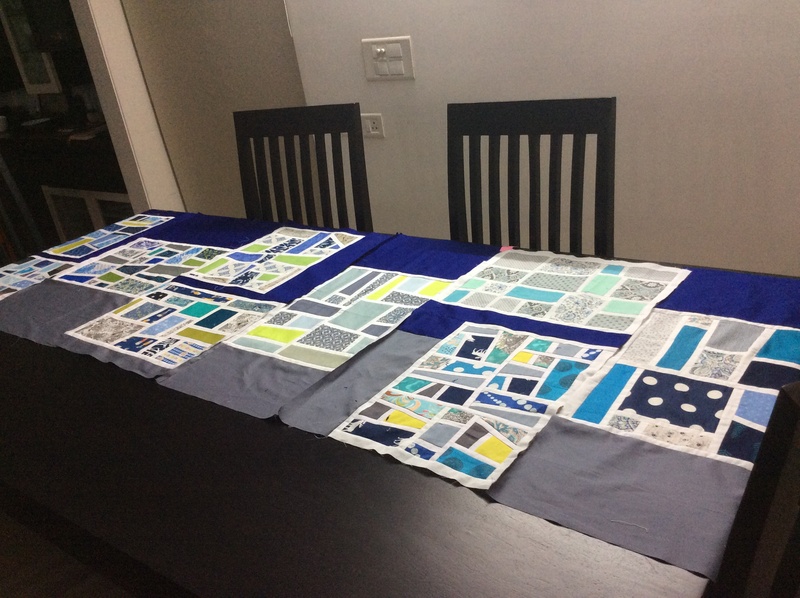 If you are new to paper piecing, you may like to get your fabric and templates ready and wait for the post with pictures, which should come up in a few days. But I do have the block pattern, including the paper piecing templates, fabric requirement and cutting instructions, right here… These instructions can also be downloaded in .pdf format from the link at the end of this post. These are instructions for the “Dusk ” colourway. The fabric requirements for the Rainbow colourway will be shared in a couple of days! 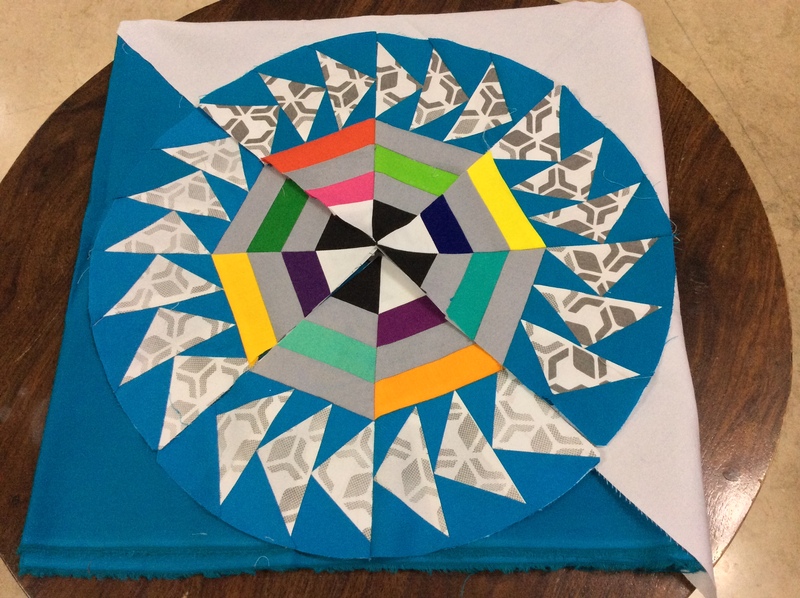 Finished Block size: 18″ square with 15″ inset circle The block is paper foundation pieced before being assembled. Corrigendum : Read Medium Blue Code 11 as Code 1 in chart above. When cutting fabric for the background, add a margin of 1/2 ” to 1″ on the outer (straight) edge. Refer to the Master template below as a guide when assembling the paper pieced templates.You can also use it to try out your own colour schemes; use colour pencils! While all my Dreamcatcher patterns are free and will continue to remain so, may I suggest you visit the webpage of my favourite NGO Samarpan and donate whatever you deem fit towards the wonderful work they are doing to spread joy, peace and happiness through the world?